Network gear maker Cisco Systems reported third-quarter profit and revenue that topped analysts' estimates on Wednesday, but shares fell four per cent after dour current-quarter forecasts indicated that the transition to a software-focused business remained a work in progress. 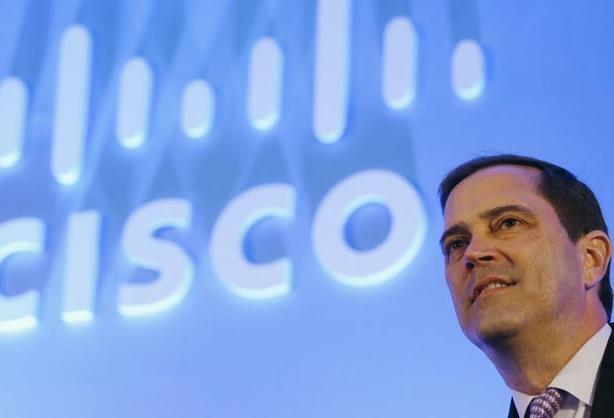 Cisco's stock has climbed 18 per cent and is the second biggest gainer among Dow components this year as investors bet on the company's turnaround under CEO Chuck Robbins. Since taking the helm in July 2015, Robbins has steered the hardware giant away from its traditional business of supplying switches and routers and into newer growth areas such as cloud, Internet of things and cyber security. Revenue in the company's closely watched security business, which offers firewall protection and breach detection systems, rose 11 per cent to US$583 million in the third quarter. That missed estimate of US$584 million from six analysts polled by Thomson Reuters I/B/E/S. The division's revenue, however, topped estimates of US$573.6 million, according to data analytics firm FactSet. Cisco's revenue from its services business also missed estimates. Revenue from the business, which provides technical and internet network support, rose three per cent to US$3.16 billion but fell short of estimate of US$3.24 billion, according to Thomson Reuters I/B/E/S. "Like other old smoke stack tech companies – MSFT, INTC, ORCL - this has been a somewhat of a slow process," said Dan Morgan, portfolio manager at Synovus Trust Company, who owns 362,980 shares of Cisco. Robbins in a post-earnings call with Reuters said he was confident about the transition. "The business model transition that we have been giving metrics on since I became the CEO continue to move in the right direction" he said. Cisco forecast fourth-quarter profit of 68 cents to 70 cents per share, while analysts were expecting 69 cents, according to Thomson Reuters I/B/E/S. The company expects revenue growth of four per cent to six per cent from a year earlier, which implies a range of between US$12.62 billion and US$12.86 billion. Analysts were expecting revenue of US$12.73 billion. "(Cisco) needs to continue to aggressively pursue acquisition while also showing that it is utilizing acquired technologies to advance its own portfolio and support growth," said CFRA Research analyst Keith Snyder. Net income rose to US$2.69 billion, or 56 cents per share, in the third quarter ended April 28, from US$2.52 billion, or 50 cents per share, a year earlier. On an adjusted basis, the company earned 66 cents per share. Total revenue rose 4.4 per cent to US$12.46 billion. Analysts on average had expected a profit of 65 cents per share and revenue of US$12.43 billion.